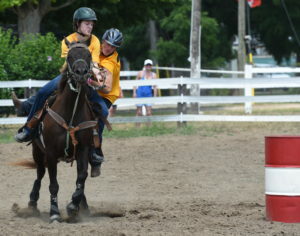 Reba Thompson of Thorndale picked up Mark Thornton of London while her horse was rounding a barrel during a “rescue race” at Aylmer Fairgrounds as Rusty Gaits Saddle Club hosted one of its monthly summer shows, Sunday, July 15. This was a benefit for ChildCan, the childhood cancer charity based in Southwestern Ontario. The club’s next show is Sunday, Aug. 19.